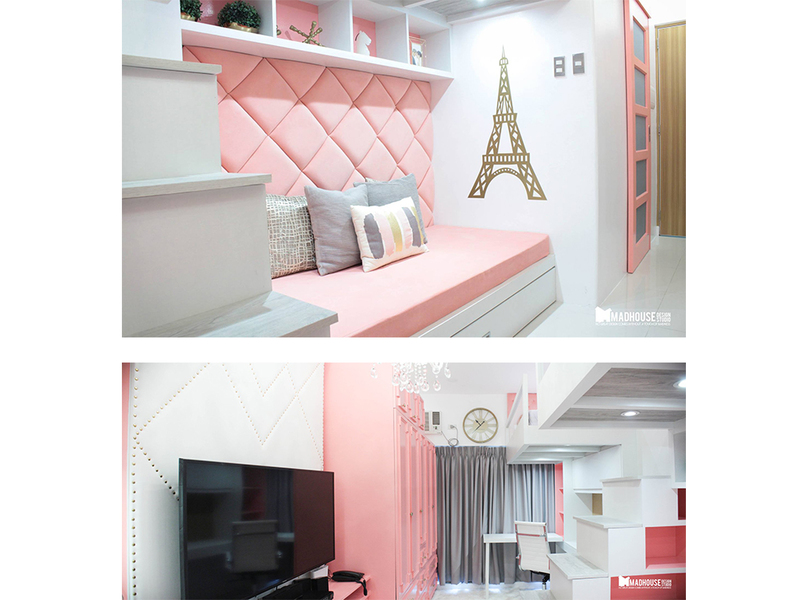 This 28-sqm pink condo was designed by Gila Salvador, owner of Madhouse Design Studio and designer/contractor for one of the condos we wrote about in one of the popular posts in this blog. There was a lot of interest for it because of the amazing job she did in transforming a 22-sqm condo to fit a family of 5! 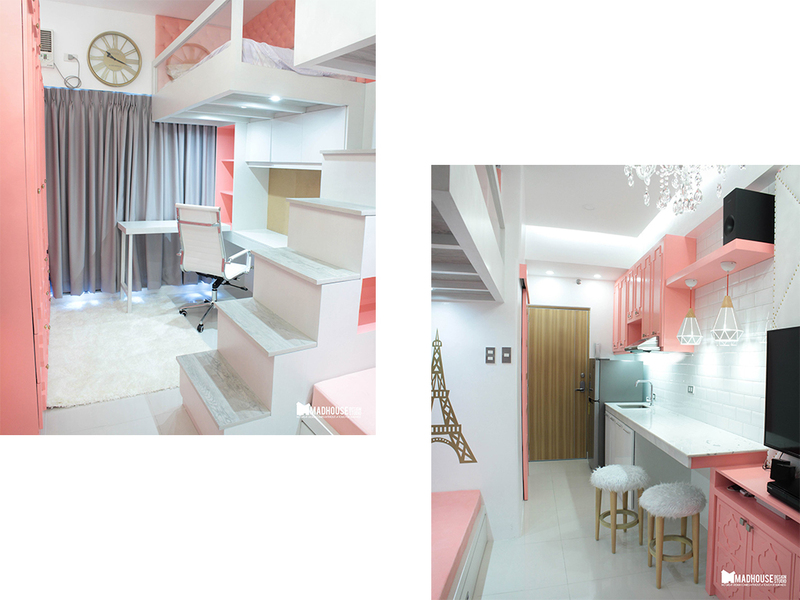 The proud resident of this pink studio is an 18-year old girl who goes to college in Manila. Her indulgent parents had this cozy haven made for her and her siblings who would be joining her in the future. Gila said, “The client wanted a mix of modern and Parisian with touches of pink.” I guess there’s nothing more Parisian than the gold Eiffel Tower decor on one of the walls. Gila calls this design the Classic Chic Finish with the pink furnishings against white with touches of grey. “A little something extra.” That is definitely what the Gila’s pink color choice gives this studio. “These nuances bring out a lot of feelings in people. It is a very positive and calming color,” explains Normann Copenhagen’s Brand Manager. “With the right nuances and styling, pink can be very exclusive, classic and sophisticated,” Britt Bonnesen goes on, highlighting pink as a trend color for 2017. Pink is hot in fashion, in interior design, even in technical products like phones, refrigerators and cars to name a few. Millennial Pink was such a trendy color in 2016 that most brides chose this hue as the motif for their weddings. Pink has been around for a long time. Housewives in the 50s chose pink refrigerators or other pink kitchen appliances. Over the years, pink has been moving in and out as a trend in fashion, interiors and product design, but it has never gone out of style. In 2015, Apple came out with the pink (rose gold) iPhone. It’s now 2018 and pink is as hot as ever. 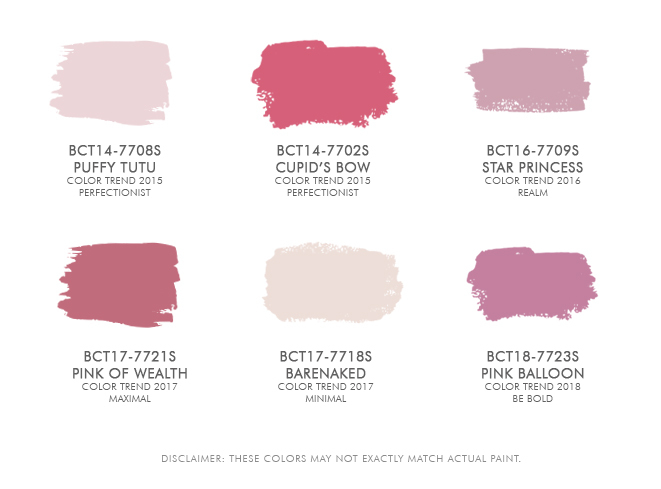 Boysen has carried several pinks since we started Color Trends in 2015. In designing small spaces you have to consider first how many people will be staying and how you can make their beds fit into the space. 2nd are the wants and needs (dining area, larger kitchen, study table) and you take these and try to fit these in the space that are left around the sleeping areas. Once the layout is final, you can now add details and designs. For such a project, it is better to go to an expert to help you because it’s not only the layout that is crucial, also the custom-fit furniture can make or break the design. Gila has a skilled team to make her designs work. I’ve never met Gila but she amazes me with her entrepreneurial spirit.. For someone so young, she has been managing several businesses. Just recently she partnered up with an investment specialist for a developer’s township in Antipolo. Her offer? If you buy land through the investment specialist, you will get your house designed for FREE by Madhouse Design Studio. Want to see more ideas for an ultra-feminine bedroom in pink? Click here.